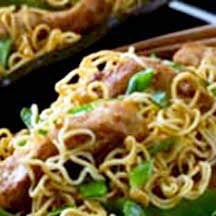 CooksRecipes has quality, kitchen-tested recipes for chicken dishes, made with pastas, noodles and macaroni, that you can count on for successful deliciousness. 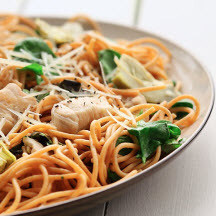 Three shades of green veggies are combined in this healthy chicken and pasta dish. It's so good and so good for you that it will quickly become a staple meal! No need to order take-out! This Thai-style stir-fry dish will satisfy your craving and keep your budget on target. Recipe from the Florida Culinary Institute. 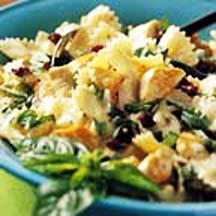 The whole family will love this bow tie pasta toss with tender chunks of chicken breast, bell pepper, Italian seasonings, cheddar cheese and a garnish of fresh basil.